In 1961 Jim Haynes, a former Klipsch employee, was transferred to Edwards Air Force Base’s Communications-Electronics Staff Office. While still at Klipsch, he had “appropriated” a pencil holder in the shape of a Klipschorn and had placed it on his new desk. This office was headed by Lt. Col. Bernard MacIntyre who quickly asked if the pencil holder was a Klipschorn. He happened to be familiar with Klipschorns, as he had built one himself under the personal guidance of PWK. Edwards Air Force Base would host a large open-house for Armed Forces Day every year. In the early 1960’s their P.A. system was considered to be largely inadequate. Col. MacIntyre was called upon to remedy the situation. Working with Jim, they specified “clustered” Klipschorns (four in a quad). As you can see from the photos, they settled for less. It is rumored that an ulterior motive for the K-horns was to improve the system in the officer’s club. The supplied speakers were painted with butyrate wing dope like they used to use on “stick and rag” airplanes for weatherproofing. Bob Moers recalled that he and PWK were actually allowed to land the company Beechcraft at Edwards. However, it was not on one of the main runways, but on an “overrun” which was about a mile long. While on base Paul spoke to their engineering group, and both of them were treated to “the grandest tour you have ever seen” - apparently including NASA projects such as flying shapes, Mercury capsules, et al. According to EAFB’s historical records, the pictured event occurred on June 19, 1964. 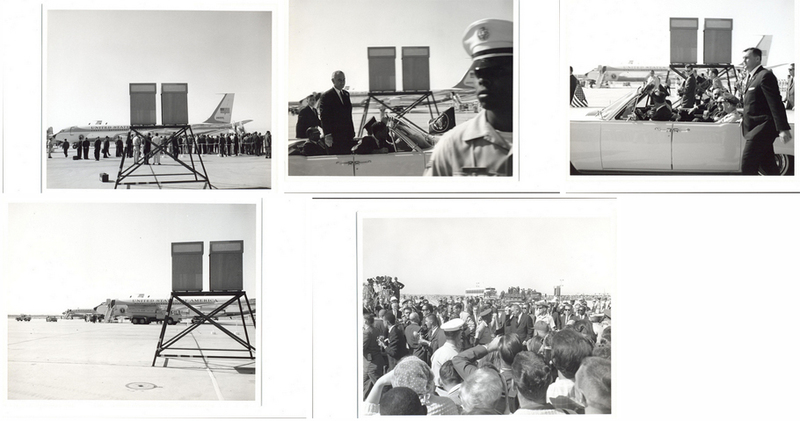 President Lyndon B. Johnson visited the Flight Test Center to tour the flight line and view a display of aerospace vehicles. Air Force Secretary Eugene M. Zuckert, the FAA chief, and an entourage of 14 California congressmen accompanied the president. The visit lasted some 64 minutes, and was regarded as highly successful.